This year we decided to travel to Indianapolis, IN, to race at the "Mini Indy Speedway" (CIQMA) at the Indianapolis State Fairgrounds. This is a Midwest Thunder Regional race, and they do things quite a bit differently than our own regional series. They do heat races, instead of batch qualifying, and they run the Honda cars on the first day and the Animal cars on the second day. Dillon started 8th in the 3rd heat race to try to make it into the feature (starting positions based on pill draw). There were 24 total Jr Honda cars trying to be one of the 10 that made it to the feature. Dillon finished 4th in his heat race which meant he started 2nd in the B-main. He finished 3rd in the B-main which earned him a 9th place starting position in the feature. Dillon started 9th and was super fast! He made it up to 6th in just a few laps, but unfortunately got caught up in a wreck and ended up in the wall. All the dads jumped in to try to get everything fixed, but they just didn't have enough time to get him back out before the race went green. He finished 10th. We are so proud of Dillon for how he raced today and for making it into the A-Main while racing again stiff competition at a brand new (to us) track! Unfortunately, the only winner for Sunday was Mother Nature. All racing activities were canceled due to rain. 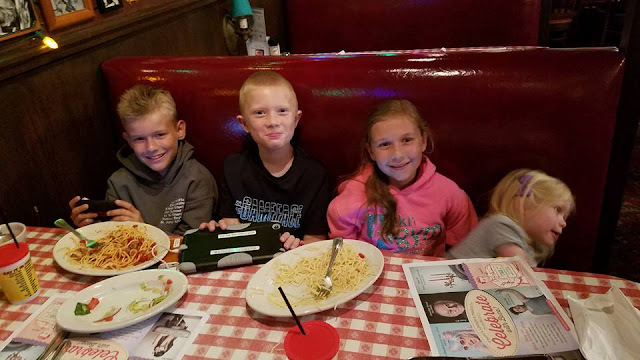 So, instead of racing, we headed into the city of Indianapolis to enjoy some Italian food and wonderful company at Buca di Beppo!